As a lifelong animation fan, I’m a bit embarrassed by how LAIKA snuck up on me. I was unaware that they co-produced Corpse Bride, and somehow I completely missed the short Moongirl they made with Henry Selick back in 2005. Of course, like everyone else I was forced to take notice with 2009’s Coraline, and take notice I did. Coraline was and still remains a spectacular achievement, and is one of the best animated films of that decade. If that weren’t enough, they followed it with the great, but tragically underseen ParaNorman, solidifying the studio as being one to watch for the foreseeable future. With all of that in mind, The Boxtrolls was one of my most anticipated movies of the year, which only serves to make it more painful that The Boxtrolls isn’t very good. I’m not yet prepared to say The Boxtrolls is a bad movie, per say, but it is an incredibly frustrating one. It seems to have all the best intentions in the world, and by the midpoint of the film I was convinced it was only a couple drafts away from being a really great movie. Unfortunately, my “hypothetical drafts needed to make this a good movie” number increased substantially before it was finished. On a narrative level, the film is completely functional. It gets from point A to point B in a way that makes sense and doesn’t resort to narrative gimmickry like too many other movies these days do. The problem, however, lies in the film’s thematics. It’s clear that LAIKA wanted to imbue this film with greater meaning, to push beyond the reaches of mere entertainment and strive for that noble goal of creating art; the problem, though, is that they never quite settled on exactly what they wanted the film to be about. The movie continually bounces back and forth, jumping from one thematic goal to another without ever taking time to expound on any of them. It’s not unlike one of those bad comedians who makes references to things everyone is familiar with, but never bothers to actually make a joke about any of them. 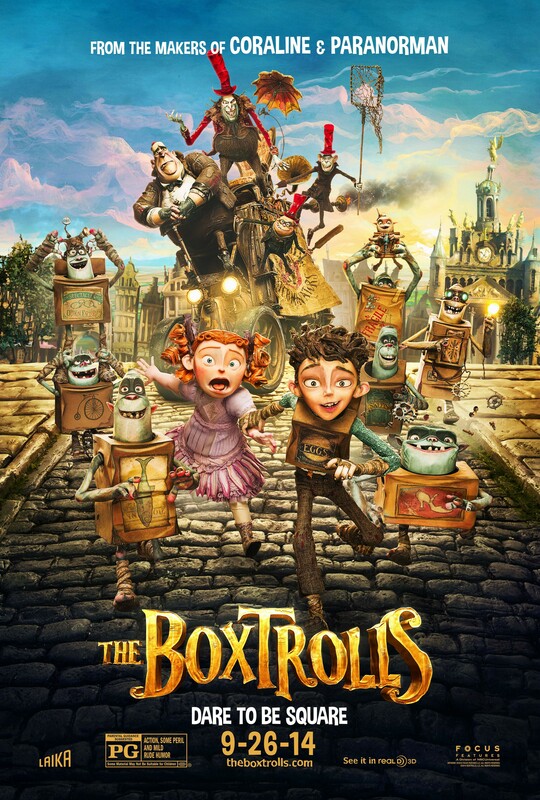 At various points, The Boxtrolls brings up themes of racism, economic disparity, father/child relationships, and the nature of a person vs. their will to change, but it never explores any of these topics enough to say anything meaningful about them, let alone create a strong thematic center to the film. Each idea is pushed into the spotlight for just long enough to be recognizable, then quickly ushered away, never to be heard from again. And while the surface level narrative is technically functional, its not inherently compelling enough to distract you from all the thematic floundering. There’s no weight or impact to the story because the subtext that’s designed to support it is a cobbled together mess. On a more positive note, the animation work is really astounding. On a purely technical level, LAIKA is doing for stop motion what Pixar did for computer animation. Because the process remains so cumbersome, it’s not likely to change the industry in the same way Pixar did, but with each film LAIKA has made massive strides to advance the art of stop motion animation. The whole thing is virtually seamless, but if you allow yourself to take a step back and think about the process that must have gone into creating some of these scenes, it’ll make your head spin. That said, as someone who has relished in the way stop motion has traditionally felt, this may be a tad too pristine, but that’s coming from a geek who obsesses over the process and gets a thrill from seeing the artifacts of it up on screen. Much like the transition from hand painted cels to CAPs in the early ‘90s, whatever we lose in nostalgia and tradition is made up for by the potential of the medium to do things it has never previously been able to. It’s just a shame that the level of polish applied to the animation process wasn’t matched in the refinement of the story. There are moments in the film, especially near the beginning, where things really feel like they’re working. Early scenes that are virtually dialogue free exploring the boxtrolls and their society are genuinely joyful, and there’s an honesty and sweetness to the relationship between Eggs and Fish that is simply wonderful. Unfortunately, this mostly serves as set up for the world and the characters, and once the story proper gets going, it quickly starts to fall apart. The human world is neither compelling enough to support the theme that Eggs belongs to this world, nor is it despicable enough to support the theme that maybe the humans who treat the boxtrolls as monsters are really monsters themselves. That blandness extends to much of the film’s human cast as well. The boxtrolls themselves are all great, and Isaac Hempstead-Wright does good work as Eggs, but despite a mostly solid voice cast, none of the other characters rise above the level of “fine.” The true standout for all the wrong reasons ends up being Elle Fanning, who delivers a disastrously flat vocal performance. It’s all terribly disappointing because I was really rooting for this one. I like LAIKA, and I’d love to see them have a big hit after ParaNorman was so tragically overlooked, but I just can’t recommend this one in good faith. Even so, I appreciate the fact that LAIKA even attempted to make an animated movie that was about bigger ideas than just babysitting your kids for an hour and a half. They failed, most definitely, but in an American animation market that still routinely releases uninspired, pandering garbage, I have to give some credit for trying. It’s just a shame they couldn’t decide what they wanted their movie to be about, so it ended up being about nothing.